How we celebrate Halloween, this week’s Link Love, and Menu Plan Monday! Happy Halloween everyone! Hope you’re having a fun, albeit somewhat healthy day! What can I say – I’m a dietitian so I’ve gotta get the healthy in there! My girls are super excited for Halloween today. Now at almost 5 years old they really get what it’s all about. Charlotte is most excited about dressing up and Sabrina is most excited for the treats. They’re going as Skye and Everest from Paw Patrol – they’re obsessed! Listen to mommy and don’t run too far ahead! Take one piece of candy at each stop and remember your pleases and thank yous. I offered to go up with them so they know what goodies to collect from each stop – this way they don’t end up with hard candies (choking hazards) and super chewy stuff (dentist’s worst nightmare)! No eating along the way. Every year I see lots of kids shoveling treats in their mouths or running from house to house with lollipops in their mouths. I don’t approve for two reasons. The first: eating along the way isn’t satisfying and doesn’t register, which means the kids (and us adults too) want more when we finally get back home. The second: it’s dangerous! It’s dark and it’s a mob scene (at least where we go trick-or-treating) and if someone gets bumped into or falls down with a lollipop in his or her mouth that’s a disaster waiting to happen. When we get back to the house, we go through everything and make piles. First I go through everything to make sure it’s safe for them to eat. No jaw breakers or home-baked goodies allowed. Then the kids can make a pile of the treats they are most excited about – those they keep. And another pile for the stuff they aren’t interested in (if that exists, lol!). Those will be given to charity – something they are learning about in school. They’ll get to enjoy some treats tonight and others will be saved for other days. We’ll see how well they follow the rules and how it goes. Cross your fingers for me!! How do you handle Halloween with the kids? My friend Sally talks about the Switch Witch strategy here and here’s a great article about what you can do about the obsession with candy on Halloween. However you choose to enjoy the day, I hope you have a fun and safe Halloween! 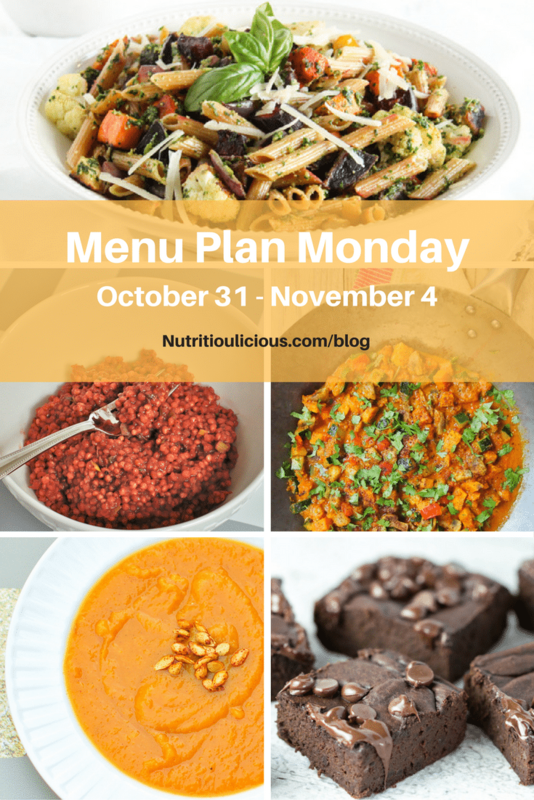 Now for this week’s Link Love and Menu Plan Monday! ⇒ With all the milk options available these days, it can be confusing to know what to purchase. Thanks to Katie for putting together this resource. ⇒ I love that Brynn is keeping it real in this post. There have definitely been times that an item on my Menu Plan Monday doesn’t actually get made. It’s just the way life goes sometimes! ⇒ I roast all my veggies on sheet pans but rarely make a whole meal on them. Boy does that need to change! I’ll be making some of these soon – look out for them on the menu plan! ⇒ I’ve added butternut squash to my lightened up mac and cheese, but haven’t done the cauliflower addition. This recipe has ‘em both! Plus some fun foodie humor in Kara’s post – had to lol at some of them! Lunch: Tuna edamame salad, sliced peppers and tomatoes, grapes, and whole grain crackers. Maybe a piece of Halloween candy too! Thanks for the shoutout, Jessica – you’re so sweet! And I love your idea of donating some of the girls’ extra candy to a charity. Hope you and your family had a great halloween! You’re most welcome Kara! Thanks – good way to teach a lesson about giving and to keep the amount of candy they eat at bay! !